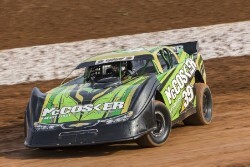 Round three of the Brims Concrete Super Sedan Series, supported by McCosker Contracting heads to Fraser Shores Maryborough Speedway this Saturday night, with another strong field entered. After the opening round was washed out a fortnight ago in Brisbane, drivers provided fans with an excellent Feature Race at Toowoomba last Saturday night, and fans can surely expect the same again on Saturday, with eighteen drivers entered. Justin Randall was victorious in round two, and will be looking to go back to back at the 360 metre venue. Randall had been consistent in last years series, and his break-through victory on Saturday night adds another dimension to the line-up. At the corresponding round last season, Matty Pascoe was successful and he too is in the field along with Trent Wilson, Darren Kane and Sean Black who filled the top five positions in last Saturday nights A Main. In fact the top ten in the round two A Main are all entered, and will be joined by Gavin Northfield and Matthew Williams, who join the series for the first time this season, making the field an extremely strong one. Racing commences at 4.00pm EST, with Junior Sedans and Street Stock also on the schedule. Photo: Bob McCosker in action.